Youth Development is the social-emotional, cognitive, and physical processes that all youth uniquely experience from birth to career. At the Y, we know that a successful development process fulfills children and teens’ innate need to be loved, spiritually grounded, educated, competent, and healthy. Participants in youth sports build skills, learn about teamwork, and focus on sportsmanship preparing them for key milestones on their developmental journey. Children will work on developing coordination, balance, and body awareness while exploring a variety of sports. Make sure to wear your tennis shoes! Registration is required. Maximum of 10 participants per class for safety and effective coaching. Parents are welcome to join their children during this class. 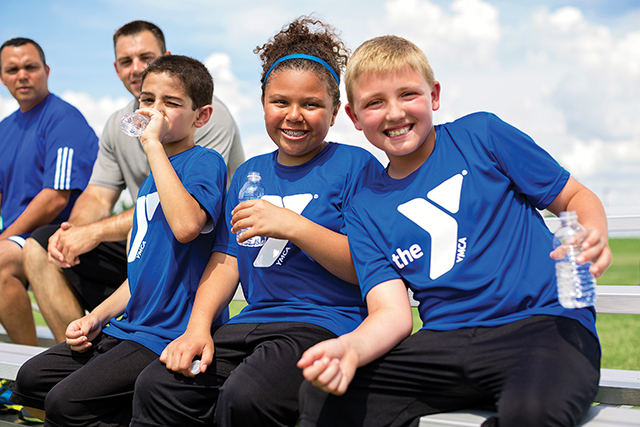 Home-schooled children ages 6-18 can fulfill their physical education requirement with this YMCA program. This program offers a YMCA sport program where the children will participate in a variety of age appropriate activities along with YMCA swimming instruction. All swimming levels and abilities will be served. Come join us at the YMCA the fourth Sunday of each month for Church/Youth Group night. Churches are welcome to bring a group of people to the Y to enjoy swimming, basketball, and the Youth Center. Each group must be supervised by an adult 21 years or older. Please call to reserve a date. Down, set, hut! Learn the basics with safety in mind. Learn to pass, catch and run like the pros. With no contact permitted the kids will learn the fundamentals of Flag Football. Registration is required. Max 10 participants per class for 3-5 year old and 6-11 year old for safety and effective coaching. This is a fundamental/beginners class on Archery. Beginning with safety and learning the parts of a bow and arrow. Participants will progress to understand patience, focus, and balance when practicing archery. Participants are welcome to bring their own equipment and must be inspected by the coach prior to being used. Registration is required! Maximum of 12 participants per class for safety. Join us for an hour filled with cardio and strengthening exercises for children who are taller than 4’4”. Initial paperwork required before your first class. Please arrive 15 minutes prior to class. See Group Exercise schedule for days and times. This class will teach the basic fundamentals of hockey. Skills include passing, stick handling, goal tending, and more! We will also work on sportsmanship and competition. Fundamentals skills will be the primary focus with various games progressing towards a hockey game. Registration is required. Come and learn the basic fundamental skills of soccer including, passing, dribbling, kicking at a goal and coordination. Groups will progress towards small group games with modifications of a soccer game. Registration is required. Maximum of 10 participants per class for 3-5 year old and 20 for 6-11 year old for safety and effective coaching. In an event that the class size reaches its maximum capacity a second class will be offered. Tennis class will teach the basic fundamentals tennis. Tennis not only teaches the kids the skills needed for the game but team work, coordination, and sportsmanship. Registration is required. Maximum of 12 participants per class for 6-11 year olds. In an event that the class size reaches its maximum capacity a second class will be offered. This class will teach the basic fundamentals of basketball that include, passing, dribbling, and shooting. Equipment is modified due to the age groups. Basketball will develop gross motor skills, hand-eye coordination and sportsmanship. Registration is required. Maximum of 10 participants per class for 3-5 year olds & 20 participants for 6-11 year olds for safety and effective coaching. *In an event that the class size reaches its maximum capacity a second class will be offered. *Maximum of 10 participants per class for 3-5 and 20 for 6-11 year olds for safety and effective coaching. In an event that the class size reaches its maximum capacity a second class will be offered. This class will teach the basic fundamentals of Lacrosse that include, passing and shooting. Lacrosse will develop gross motor skills, hand-eye coordination and sportsmanship. Registration is required. Max of 12 participants per class for 6-11 year old for safety and effective coaching. *In an event that the class size reaches its max capacity a second class will be offered. two practices a week teaching drills and skills. 9 a.m. and Noon based on the league schedule. for home and away to be worn during game days. After the game each child will receive a free snack. Copyright © 2012 YMCA of the USA. All rights reserved. Website created by Semonik Creative and MGSOFT-NET, INC.